We have some awesome news… Rabbitats is one of the recipients of Oxbow’s 2018 Animal Rescue Grants! We’ll be getting a cheque for $4650 US to go towards sanctuary housing at our new location in Richmond. The property has the space to build several enclosures for some of the many abandoned rabbits we’re dealing with. The total budget taking us to 2020 is well over $100,000 (and that’s with used and donated materials) and this is a great start! These funds will directly save the lives of many rabbits! We can’t thank Oxbow enough!! RIP Karen Kelly. Heaven has gained quite the angel. Karen would come all the way from Victoria to volunteer at our events and transport or foster rabbits, all on her own dime. She and Ann Ricia, our incredibly supportive Victoria contingent would travel together delivering a car full of awesome things for our online auctions. Karen was diagnosed with cancer, but told us it was going to be okay. We knew it wasn’t when a friend brought Squidge, a tiny lionhead she was fostering, back to us last week. Karen helped out so many animals in her too-short life, her loss is devastating for them and for us. She was a beautiful soul, inside and out. 2019 Rabbitats Calendars Available Now! The new year is fast approaching and it’s time to order your new 2019 Rabbitats calendar! Calendars are $20 each + shipping with 100% of profits going directly towards Rabbitats. For your convenience pickup can be arranged in either South Surrey or Richmond. To place your order and for more information please email calendar@rabbitats.org. Be sure to get one while supplies last! Olaf & Nutmeg, two of our favourite big colony bunnies, have decided lately that life is better together ♥️ and we’re thinking that, if the right adoptive family is interested in giving them a home, these two can retire from colony life together! Olaf is almost 6 years old now and has less patience for the shenanigans of the spirited younger buns. Nutmeg is almost 4 years old now, and being a Rex bunny with insatiable curiosity, definitely needs a home with lots of room to roam and adequate bunny-proofing. The sweet thing is that Nutmeg has never travelled well with other bunnies to our events, so usually got her own carrier, but she’s peaceful as can be with her big man Olaf. Please contact us if you think you have the right home for these two big-personality bunnies. Not sure if you are allergic to rabbits? Adopting a rabbit is a huge responsibility and can be severely complicated if turns out you or someone in your family is allergic. HealthLabs.com recognizes how important this factor is to pet adopters and has offered Rabbitats adopters a free Rabbit Allergy Test (an $98 USD value). 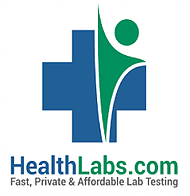 All you have to do is go to www.healthlabs.com/rabbit-allergy-testing, add the Rabbit Epithelium Allergy Test to your cart and enter “Rabbitats” as the promo code. You can also claim these tests by calling 1-800-579-3914 and mention that Rabbitats has a partnership with HealthLabs for a free rabbit allergy test, and they will add it to your cart for free.